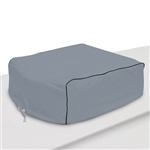 These RV Air Conditioner covers are designed specifically for certain model AC units. They are formed so it is hard to get a dimension on it, Classic Accessories said they could give me an approximation on the dimensions but it will not tell you if it will work with your AC. If you could tell me what model AC unit you have, I could find you the correct cover.